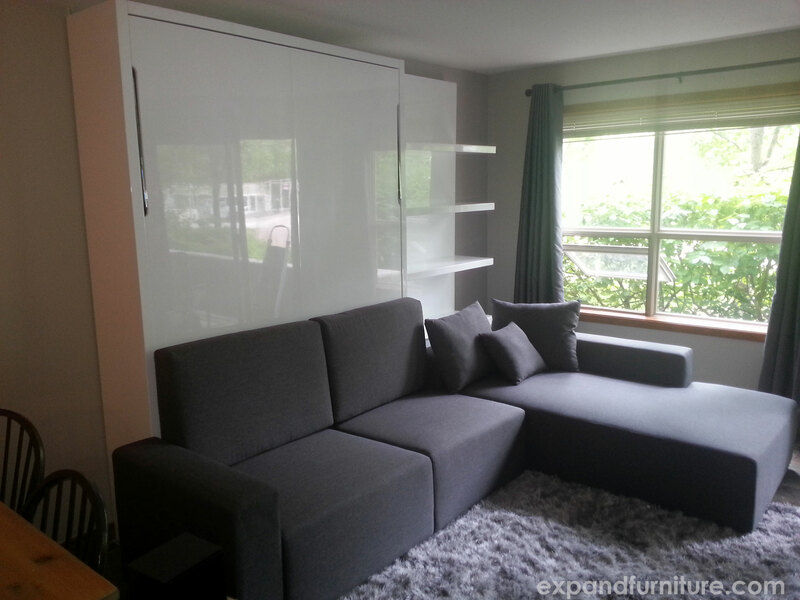 We installed this designer wall bed sofa system at a cabin in Whistler, Canada. The cabin already has 1 bedroom in it but now it features an extra full queen size bed that can fold down over top of the sofa. Two extra people can comfortably sleep in this ski resort getaway. Behind the chaise is a built in storage box for the bedding as well as 3x 100cm wide shelves which are convenient for vertical storage. Inside the sofa is room for additional storage. It could be used for bags, or simply additional sets of sheets or other various household necessities like boardgames! The biggest feature of this sectional wall bed system is that it can fold over the sofa. Many wall bed systems require you to move everything out of the way in order to fold down, but not this system. You can even leave most ottomans and coffee tables in place, making a smooth transition from a living room into another bedroom in this whistler ski cabin. The ash grey sofa is an excellent color to match decor with as well it is very good at hiding marks or stains which may occur from guest use. Additionally a child or small person could comfortably sleep on the large chaise, providing a little extra sleeping room in a squeeze. The balanced wall bed mechanism allows it to be very safe, it actually hovers mid air so it will never come flying down with force like an older style wall bed would. Very light and easy to lift and lower and a definite space expander for this lovely Whistler cabin.